As the dust storm continues to rage on Mars, data from the Mars rover Curiosity since May shows the insulating effect of all those particles in the atmosphere. The spread between hi and low temperatures has narrowed by about 36 degrees Fahrenheit as dust blocks sunlight from reaching the ground and traps some heat in overnight. Daytime highs have dropped around 28 degrees and overnight lows have warmed about by about 18 degrees to 78 degrees below zero. 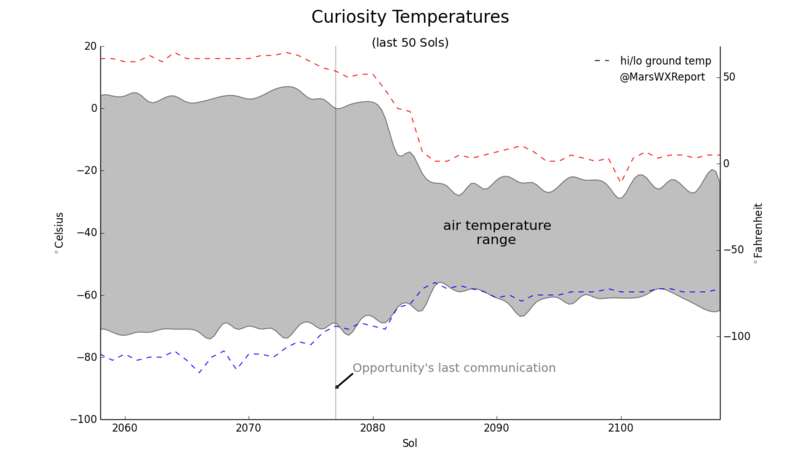 Curiosity hasn’t seen temperatures above freezing since late May. And we’ve not heard from the Opportunity rover since early June. 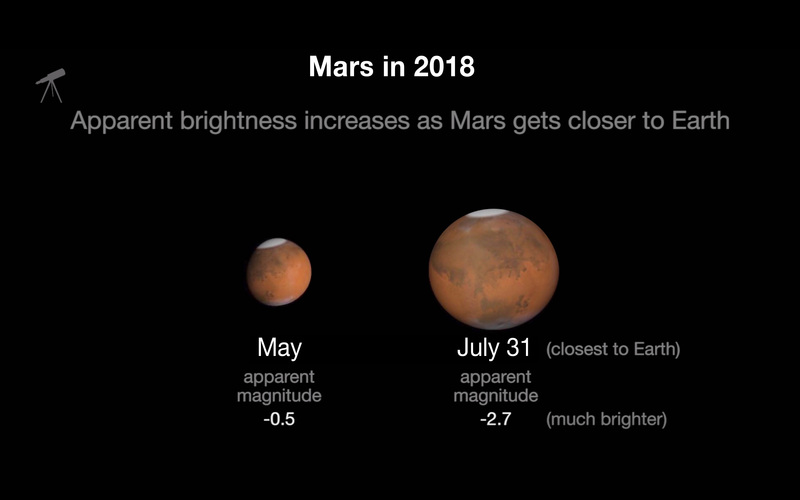 Elsewhere in the sky, Mars has been bright this July and will continue to be through August as it makes its closest approach to Earth later this month. At 7:45 UTC on July 31, Looking across 10,000 years. Mars will be at its closest since the year 2003 and won’t be closer until 2035.Look about an hour after sunset in the east. It reaches the highest point in the sky around 2:30 am. 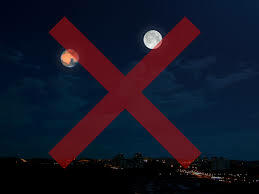 Ignore any social media posts or emails you receive claiming that Mars will look as large as the full Moon to the naked eye. What is now known as the Mars hoax first made the rounds in 2003. So whats true and what is not? Mars will be at its closest and it will be bright and easy to spot as a result. It will not be as big as the moon. We measure the apparent size of things in the sky using angular diameter. The apparent diameter of the Moon is about half a degree. The apparent diameter of Mars doesn’t exceed around 24 arcseconds, less than half that of the Moon. This is also not a once in a lifetime event. It happens every two years. You’ll have your chance again in October of 2020. It won’t be as close, but I challenge you to see the 2 arc second difference., certainly with the naked eye. But what if Mars did appear as big as the moon? Mars is about twice size of the Moon but nearly 9 times the mass. If Mars ever did come close enough to rival the moon in the sky, gravity would alter Earth’s orbit and create devastating tides. But it can’t so it won’t so we shouldn’t worry about it and just enjoy the night sky instead.